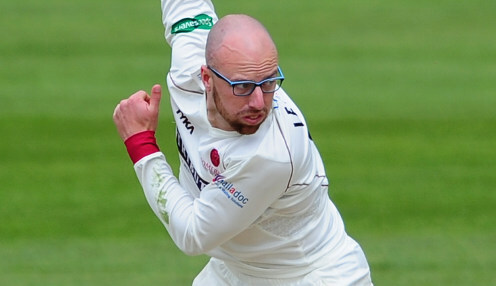 Left-arm spinner Jack Leach was pleased to have contributed hugely to a second successive victory for Somerset in County Championship Division One. The 27-year-old England star took 6-36 as Nottinghamshire were skittled out for 126 in the second innings of the match at Trent Bridge, leaving Somerset winners by an innings and 14 runs inside three days. The Taunton outfit had beaten Kent by 74 runs in their opening match of the campaign, with Somerset still desperate to finally secure a first County Championship title. Leach told his county's official website: "You want to be contributing to the team. The first couple of days in this match I felt like I hadn't, so was desperate to contribute where I could. "It was nice to get a spell under my belt and things began to happen very quickly after that. There was the odd one that turned. "When I first came on there was a little bit of drizzle in the air and it was skidding on quite well. After lunch there was more turn and I just tried to mix my pace up a little bit and play with my angles." Leach has played in four Test matches to date for England, taking 20 wickets at an average of 24.90. He enjoyed plenty of success over the winter in the 3-0 series triumph in Sri Lanka, claiming 18 wickets at 21.38 as the Three Lions whitewashed their hosts.